It is often impossible to meet a deadline with an army of one. For this reason, many codebases and frameworks designed to allow multiple developers to modify and add components, simultaneously and independently, without creating unexpected problems elsewhere in the codebase. We will classify such codebases as modular. We will explore existing modular codebases and study the characteristics that permit concurrent development. From there, we will detail how to achieve modularity in arbitrary Python codebases using Python language constructs. In the programming world, term “modular” is a common descriptor for paradigms and languages. We will concentrate on the definition of modularity as it applies to codebases. A modular codebase is one that is carefully designed by a project manager or lead developer to create a smooth concurrent development experience for a team of programmers. Modular codebases are everywhere in the world of web development. The concept of modular codebases fits nicely into the workflow of a web development team. Simply put, developers can work on different pages of a website at the same time without breaking each other’s pages. 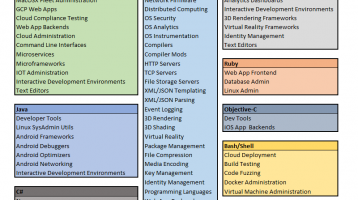 In this light, modular codebases are practically a must-have for web development teams. Below are a few MVC (model-view-controller) frameworks and CMS’s (content management systems) that are modular PHP codebases. When teams work in these CMS’s and frameworks, they start with the core modular codebase and build outward towards their goals. The initial codebases both support and enforce modular development. Regardless of reader’s understanding of PHP programming frameworks, it is important to understand just how simple concurrent development is with each of these frameworks. Bob initializes a new WordPress plugin called wp-school. Bob begins building principal.php the landing page for the principal, in wp-school. Joe begins building teacher.php the landing page for the teachers, in wp-school. Phil begins building student.php the landing page for the students, in wp-school. Joe ended up building a useful function for projecting GPA’s of students, he creates a shared toolkit utils.php and places his GPA function inside. Bob and Phil import utils.php into their pages, preventing them from duplicating code and work. Bob reminds Joe that utils.php must contain function declarations only, because it is a shared toolkit. 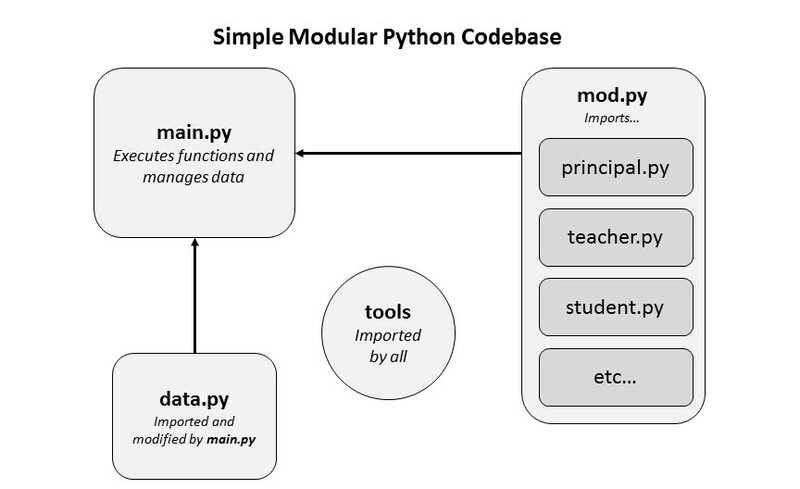 We’ve spent a lot of time talking about modular codebases without talking about Python. 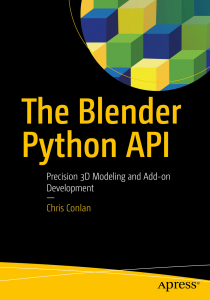 While Python is a modular language, built-from-scratch Python projects are rarely coded with concurrent development in mind. This is especially the case in data science and numerical programming where complex number-crunching and algorithmic acrobatics are the focus of the project. Our goal is to learn how to build any Python codebase so that it permits concurrent development. We will discuss a loose framework for modular Python codebases that relies on shared assets, dynamic loading, and dynamic calling. This module is the typical main script that calls the other scripts. The file main.py will be called to execute the program. Essential to a modular codebase is a shared toolkit where project-specific functions are stored for reuse throughout other modules. This toolkit can be a single module tools.py or a library tools. We will refer to this toolkit generally with bold-type as tools throughout this discussion. Any developer can make additive modifications to the toolkit. This includes adding functions and non-destructively modifying existing functions. These modules contain only functions and function-classes. The modules will be dynamically loaded for use by main. The idea is to specify the same set of functions and classes in each module so that each module can be treated as a variant of each other. In our school application example, each role, principal, teacher, and student, will have a login process, a logout process, a messaging process, and an account admin process. We will make three modules, principal.py, teacher.py, and student.py each containing these four core functions. This module will be imported by main for dynamic use. We will call this module mod.py in our discussion. … and the codebase now supports the new roles. All the while, we have not modified any of the core functionalities or behaviors of the codebase, and our developers were able to work concurrently without causing problems for each other.